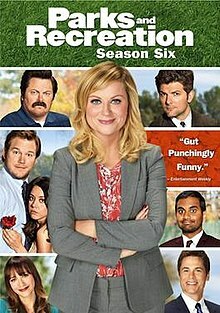 Ann Perkins (Rashida Jones) and Chris Traeger (Rob Lowe) move to Michigan to start their family and out of the series. The main plot of this season is coping with the merger to Eagleton. Diane (Lucy Lawless) and Ron and get married. The trip to London was due to Chris Pratt filming Guardians of the Galaxy. He returned to the series in the tenth episode, the series’ 100th episode.